On December 19, 1843, Charles Dickens’ novella “A Christmas Carol” was published in London, its first edition sold out by Christmas Eve. No other book or story by Dickens, or anyone else (except the Bible,) has been more enjoyed, referred to, criticized, or more frequently adapted to other forms of media. One of my favorites was watching Patrick Stewart performing his one-man version of the play at the Old Vic Theatre in London back in the early ’90s. None of Dickens’ other works is more widely recognized or celebrated within the English-speaking world. Some scholars have even claimed that in publishing A Christmas Carol, Dickens single-handedly invented the modern form of the Christmas holiday in England and the United States. The movie “The Man Who Invented Christmas” argues that very point. Indeed, the great British thinker G.K. Chesterton noted long ago, with “A Christmas Carol” Dickens succeeded in transforming Christmas from a sacred festival into a family feast. In so doing, he brought the holiday inside the home and thus made it accessible to ordinary people, who were now able to participate directly in the celebration rather than merely witnessing its performance in church. I wrote about the life of Charles Dickens a few years ago on the anniversary of his 200th birthday here. Many of our American conceptions of what a “traditional” Christmas is comes from this time in Victorian history. Queen Victoria of England had married less than three years before the publication of this book. Her German husband Prince Albert brought some of his native customs to England (including the Christmas tree), beginning some of the traditions of Victorian Christmas. 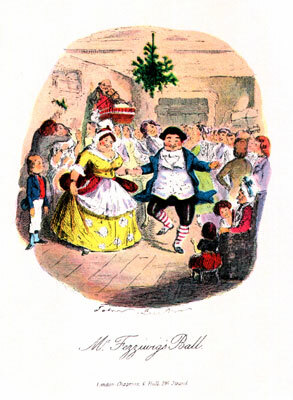 Dickens’ book popularized that style of celebrating Christmas in England and around the world at that time. In the mid-seventeenth century, the Cromwellian Revolt in England had abolished the monarchy as well as the celebration of Christmas. Though the monarchy was subsequently “restored,” the traditions of the winter holiday never quite recovered. But the earlier religious proscription was not the only cause of the decline of Christmas. Even by the beginning of the nineteenth century, the Industrial Revolution, especially in the north of England, was changing the communities that still tenuously kept the customs of their ancestors. By the time A Christmas Carol was written in 1843, the lavish celebrations of the past were a distant, quaint memory. Some still remembered them, and even before the Carol, a few popular books attempted to record the celebrations of the past, such as The Book of Christmas by T.H. Hervey (1837) and The Keeping of Christmas at Bracebridge Hall by Washington Irving (1820). But social forces beyond simple nostalgia were at work, rekindling the need for winter celebrations. Dickens was one of the first to show his readers a new way of celebrating the old holiday in their modern lives. His Christmas celebrations of the Carol adapted the twelve-day manorial (Yule) feast to a one-day party any family could hold in their own urban home. Instead of gathering together an entire village, Dickens showed his readers the celebration of Fred, Scrooge’s nephew, with his immediate family and close friends, and also the Cratchit’s “nuclear family”: perfectly happy alone, without the presence of friends or wider family. He showed the urban, industrial English that they could still celebrate Christmas, even though the old manorial twelve-day celebrations were out of their reach. Dickens’ version of the holiday evoked the childhood memories of people who had moved to the cities as adults. The book has been called by some a “sledgehammer” against the ills of industrialism and consumerism. Dickens’ own father had been sent to London’s Marshalsea debtors’ prison, and Charles Dickens himself bitterly remembered having to leave school, and work in a boot-blacking factory at the age of 12 near Convent Garden. He’d seen children working long hours in the tin mines and attending poor schools. He modeled the Bob Cratchit’s lifestyle on his own experiences living in Camden Town, London. 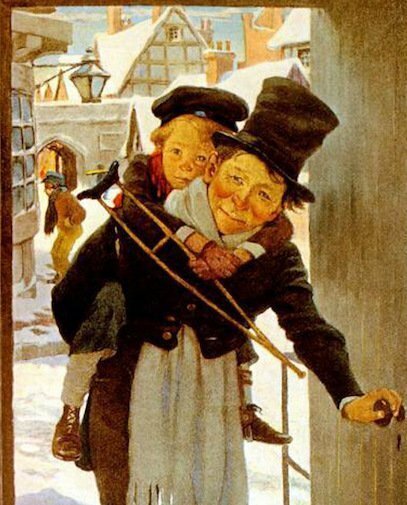 Dickens demonstrates that even in poverty, the winter holiday can inspire goodwill and generosity toward one’s neighbors. He shows that the spirit of Christmas was not lost in the race to industrialize but can live on in our modern world. The publishing of his book was immensely popular — it’s initial printing of 6,000 copies sold out in three days — and within six months it sold out its seventh edition. A Christmas Carol is generally associated with the Christian winter holiday season, for it does contain references to Christ “who made lame beggars walk and blind men see.” And so, at the end of the story, we see both lame and blind touched by the Spirit of Christmas. Nevertheless, its themes are not exclusive to Christianity, and it inspired a tradition for decades in Christmas books and celebrations that appealed to many non-Christians as well. It quickly was adapted to the stage in less than two months, and Dickens himself would read it during his speaking tours. It was the choice for his first public reading in 1853 and his farewell performance in 1870. He died in 1870 about a month after his last public reading of A Christmas Carol, at the age of 58. Their faithful Friend and Servant, C.D., December, 1843. I learned a few new things about Charles Dickens in your article. I wasn’t familiar with the Cromwellian Revolt or the Twelve Day Yule Feast. I am beginning the unit on Charles Dickens and am planning to have students construct a lit trip. My goal is to make sure they learn something new each day- I just did as well… thank you! Pleased to hear it Paula. I spent a week in London last December researching Dickens. You might enjoy my article celebrating his 200th birthday History of Charles Dickens: 200 Years. Great article on my all-time favorite story. I never get tired of rereading the book or seeing various productions. The best ever. Let’s see how succinctly I can put this. I am a Special Educational Aide at an upper grade school. We are continuously brow-beaten with data, we are continuously told to generate more data. We are told without data, you are just another person with an opinion. I have grown to despise data. It dehumanizes the students and us all. Is there a place for Dickens’ Christmas Carol in a world ever more dominated by data? Dickens puts it well when Marley says do you believe in me or not, Scrooge. Do you doubt your senses? We no longer observe. We are ever-growing collectors of data. I believe A Christmas Carol talks about REAL truths, yet Dickens does it without data. Where is our space for being our true human selves in education? I believe science and wonder go well hand in hand, maybe go best hand in hand. Chucking wonder to the ditch for the sake of data is dangerous. Some say seeing is believing. Others say believing is seeing. Great write-up, thanks, Bill! My daughter is a History major (senior in college), so I’ve shared it with her as well. Thanks Scott. I was a history major in college too!